Vans has crossed ankles with Los Angeles footwear designer Charlotte Stone to create a line of eco-friendly sneakers derived, in part, from salvaged plastic bottles. Featuring 100 percent recycled-canvas uppers, waste-free rubber soles, and water-based glues, the three-piece Vans x Charlotte Stone collection offers a clean minimalism that dovetails with Stone's own ultra-modernist sensibilities. But simple isn't the same as boring. 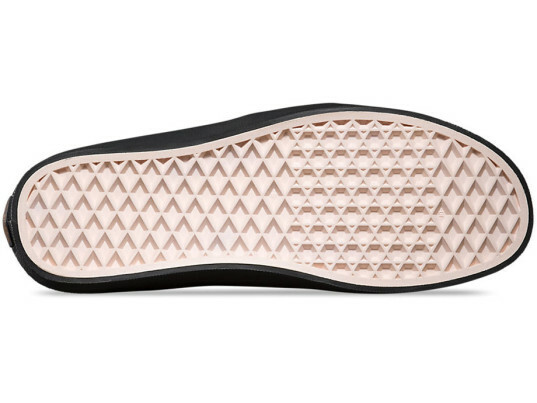 In addition to the contrasting silhouettes—a ballet-inspired slip-on, a classic plimsoll, and a chukka-esque high-top—the shoes include details such as metallic foil prints, rose-gold octagon eyelets, and waffle embossing. The shoes aren’t completely animal-free, however. They incorporate Vans’s patented washable “UltraCush Eco” footbed, which—bummer for vegans—is lined with suede. Although Stone usually works with leather, she decided on a different tack. "With the Vans project, I had to think about how to make them special without using leather, and also how the Vans girl was going to wear them," Stone told Racked. "That's when I decided to use the recycled canvas. It felt super luxurious; it has a nap that makes it feel like kid suede, but it's durable and practical and of course the eco-component is the most important." The shoes aren't completely animal-free, however. They incorporate Vans's patented washable "UltraCush Eco" footbed, which—bummer for vegans—is lined with suede. Still, Stone says she considers the ecological impact of every decision she makes. "I'm a surfer—albeit not a very good one—and I have to take care of my environment," she said. "Every season I try to make better choices for materials and manufacturing."